Here’s another great feature : Hybrid Resources. Hybrid Resources are declared in 3D Mapping Cloud but the data is stored in a different environment, e.g. Orbit GT’s 3DM Publisher (for on premise installations). The technique of declaring Hybrid Resources allow users to blend publicly available content with their own private content, even when not physically stored in the cloud. In every viewer or SDK-based plugin, you can now access and visualise data from different storage environments in a single view. Here’s an example use case. If you are an organisation that is not allowed to store its data in the cloud, you will opt for Orbit GT’s Publisher for an on premise installation. That way, you have security under full control for your 3D mapping data. Some resources however are either publicly available, purchased from a third party or provided by a contractor. So here’s a need when you want to access both your own protected data as well as third party data, in one view. This can now be done easily. Within your premises, you will have access to your private 3DM Publisher installation, and can declare how to access it. Secondly, select the Resources that are declared in the 3DM Publisher to become available via 3dmapping.cloud. 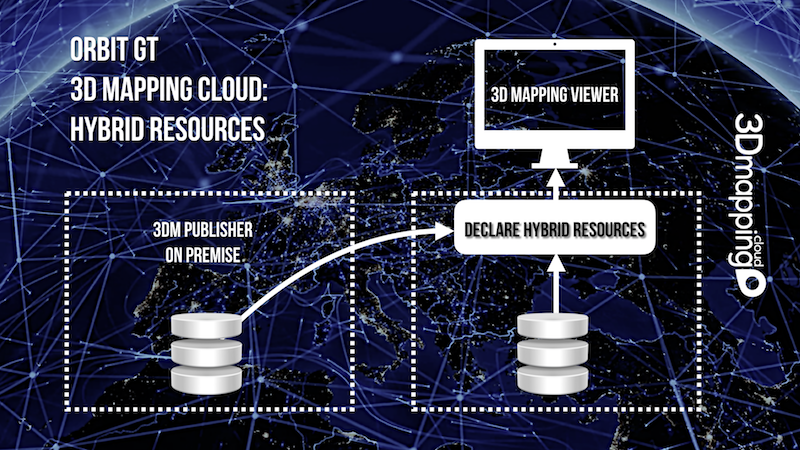 Third party content already is made available through 3dmapping.cloud. So now, you can open resources from both 3rd party as form your private 3DM Publisher in one go. Simple and extremely productive !